When I made my first patchwork quilt, all those years ago, I knew that it would be made out of patches, that goes without saying. I also knew that they would be sewn together individually. Though I wasn’t sure whether I should do this by hand or by machine. 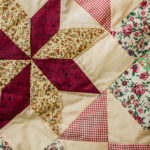 I also knew that quilts were padded somehow, but I wasn’t sure whether each individual patch was padded as it was made, or whether the padding was added afterwards. In fact I really didn’t know much about the process at all. I had never handled a patchwork quilt and only seen them in photographs. And I knew nothing about the quilting stitches that bind a quilt together. So I bought a book on quilting to guide me and discovered I had quite a lot to learn. A quilt consists of three layers. Two fabric layers, and a padding layer sandwiched in between. It is this padding, often called batting, that gives the quilt its weight and warmth. Stitches are passed through all three layers of the quilt, binding the layers together and creating a pattern as they do so. Even plain fabric quilts can be very intricate and beautiful just by virtue of the way that they are stitched. I have a plain white quilt on my bed which is elaborately quilted and looks nothing like the boring bedcover it would have been without that stitching. In a patchwork quilt, the top layer, is of course a patchwork. This patchwork is a beautiful composite made from many different pieces of fabric which are arranged in one of many different possible patterns. Often, many similar ‘blocks’ are joined together to form the patchwork, each block consisting of a number of small patches arranged in a particular order. There are some very beautiful and traditional block patterns to choose from, or you can invent your own design. The bottom layer, or back of the quilt is usually fairly plain, often consisting of all the same fabric. In a large quilt this may consist of several large strips sewn together. In between these two layers is the padding or ‘batting’ that gives the quilt its thickness and warmth. In the old days, worn out old blankets or clothes were used for ‘batting’ – nothing was wasted and quilts were probably quite heavy. Nowadays we tend to use very light man made fillings of various thicknesses so your quilt will be manageable to fold, carry and wash.
You can buy your batting by the yard from a quilting supplier. It comes on a roll and very large quilts will need several strips side by side. 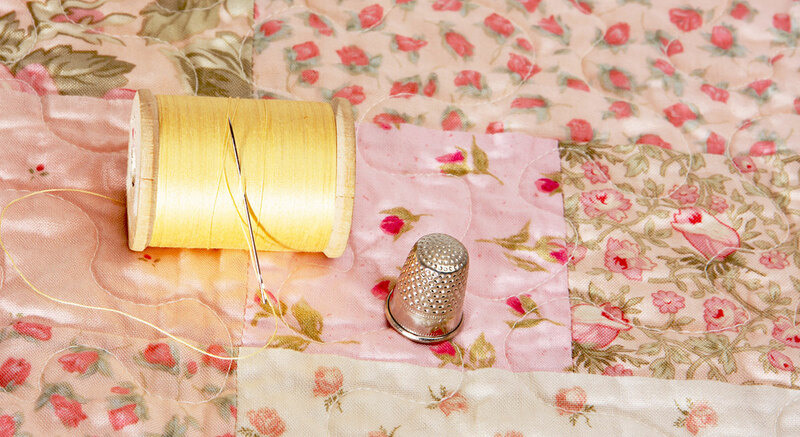 Often, the fabric shapes and sizes will influencing the way in which the quilting stitches are made. It’s quite an involved project, as you can see, but immensely satisfying. SEND ME THE NEXT ARTICLE! 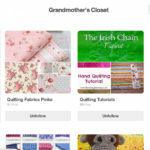 Quilting adventures and updates delivered free, to your inbox!